Designer is such a broad term. We designers have our hands in many, many industries. My own experience ranges from board game, roleplaying game, and video game design, to web, UX, and print design. I also have a background in psychology and sociology, which factors into my work more than I ever expected it would. The beauty of this book is its simplicity. Krug takes a witty, straightforward approach to design and UX testing. 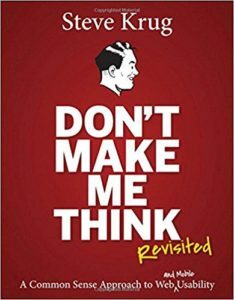 Don’t Make Me Think, Revised is mainly about web design, but the principles and conventions in the book can be generalized to other fields of design. If something is usable—whether it’s a website, a remote control, or a revolving door—it means that a person of average (or even below average) ability and experience can figure out how to use the thing to accomplish something without it being more trouble than it’s worth. I’ll be honest with you. I’ve only read the 2006 version of this book, which is very good, but obviously outdated. 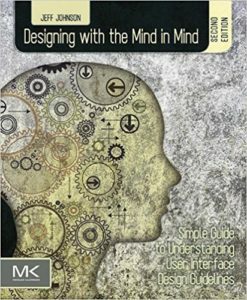 In this revised 2013 edition, Krug updates a lot of the examples from his original book and adds information about designing for mobile devices. I’ve been designing for mobile since it went from being the third screen to the first screen, so I’m definitely keen to pick up this revised edition! 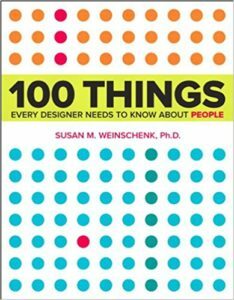 In this book, Weinschenk approaches design from a psychology background, which really appeals to me. She looks at design in terms of how users see, hear, think, read, remember, and feel. She has five fabulous chapters (“things” 85–89) just on mistakes! Each chapter (I’m going to call them chapters, but really they are “things” 1–100) in the book has a section at the end called “Takeaways” in which Weinschenk breaks down the main ideas from that chapter. Chapters 90 and 91 are the most interesting to me; they deal with how people tend to make decisions unconsciously, but will attribute their decision making to a rational, logical reason (while remaining unaware of the actual reason they made that decision). This book is a quick, easy read and is full of interesting insights into humans and what drives them. 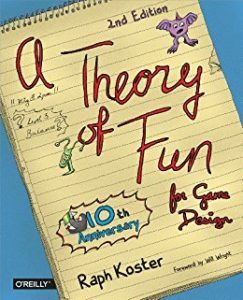 While A Theory of Fun is focused on game design, a lot of the principles within it are applicable to many areas of design. Plus, it’s bursting with illustrations and is a delight to read. Koster opens by telling us that we’re hardwired to learn from play, and from there, goes into a lot of design theory fortified by examples. Koster spends a lot of time investigating the end-user experience, and shows how users (or players, in the case of games) tend to make decisions based on mostly subconscious, “chunked” information. He explains why some games get boring quickly, while others can entertain for years and years. Games aren’t stories. Games aren’t about beauty or delight. Games aren’t about jockeying for social status. They stand, in their own right, as something incredibly valuable. Fun is about learning in a context where there is no pressure from consequence, and that is why games matter. In this book, Horton and Quesenbery bridge the gap between the theory of web accessibility and the best practices outlined by WCAG2. Instead of looking at accessibility as an afterthought that you can tack onto good design, A Web for Everyone shows that accessibility is good design. The book addresses topics of accessibility for designers, content creators, and developers. It mainly focuses on web design, but again, there are a lot of crossover principles into other design fields. In the introduction, Horton and Quesenbery state that about 650 million people worldwide (10% of the population) have a disability of some kind. This book will help make your website usability more universal. In this book, Johnson helps us untangle different, sometimes competing, design guidelines. He takes a psychological approach to design problems and design goals. 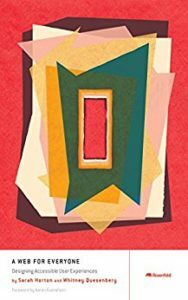 Johnson’s book is a little more on the academic side, so if you like reading abstracts and perusing peer-reviewed journals, Designing with the Mind in Mind will probably appeal to you. Even if that’s not really your think, I think Johnson does a good job of making the experiments he cites accessible; he gives down-to-earth examples of ways to apply the theories in the book. I am Sara Quinn—a graphic designer with Squid&Crow, a writer, and an artist. You can follow my current projects at Squinnbloggen.com and @SquidAndCrow on Twitter. I also volunteer with some wonderful local organizations including Enterprise Week and Tri-City Area Gaming.